You are here: Home › Stayfitcentral Health & Fitness Blog › Health & Fitness Blog › Buyers Guides › Which Is Better Creatine Ethyl Ester Or Creatine Monohydrate? Creatine Ethyl Ester (CEE) supplements are marketed by their manufacturer’s as being superior to creatine monohydrate. Until recently, there has been little if any scientific proof to prove whether CEE supplements are better than creatine monohydrate powder so all we as consumers had to go on was a supplement companies claims. Fortunately there is finally scientific data to give us evidence as to which creatine supplement is better. In this study Dr. Richard Kreider and colleagues at Baylor University put creatine ethyl ester to the test to see if it is in fact, better than creatine monohydrate. The study consisted of men who worked out regularly with weights. They were separated into three groups: one that took creatine ethyl ester, a creatine monohydrate group, and a placebo group. Each group took 20 grams of their given supplement daily for 5 days and then took 5 grams a day for the remaining 6 weeks of the study. This, as you may know is the dosage most experts recommend you follow when taking creatine. Tests were performed before, during and at the end of the study. They included tests to measure strength, muscle mass, and blood and muscle creatine levels. The results, as you will soon learn make it clear which type of creatine supplement you should use, especially if you regularly work out. The results from the study find that creatine monohydrate is superior to creatine ethyl ester. The amount of creatine stored in the subjects muscles was increased after just 6 days in the creatine monohydrate group while it took over 20 days to increase in the CEE group. The CEE group also had greater levels of creatinine, a worthless byproduct of creatine after it is broken down by your body in their blood. While the subjects in each group did become stronger and added muscle, subjects taking either type of creatine did not show any benefits over the placebo group. The take home message from this study are that if you want to use creatine, your best bet is to use creatine monohydrate powder. More will get into your muscles faster and your body will break down less into worthless byproducts that have no performance or health enhancing benefits. When shopping for a creatine supplement also make sure you buy a product that uses Creapure brand creatine monohydrate. This is because it is tested to be free of impurities with each scoop containing 99.5% pure creatine monohydrate. 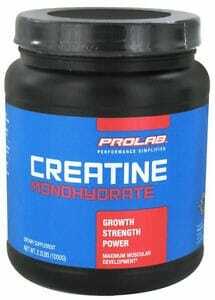 My favorite creatine monohydrate supplements is Prolab Micronized Creatine. It uses Creapure creatine and since it’s micronized it dissolves more completely in water and stays that way longer so none of it is wasted, stuck to the bottom of your glass. Source: Spillane M, Schoch R, Cooke M, Harvey T, Greenwood M, Kreider R, Willoughby DS. The effects of creatine ethyl ester supplementation combined with heavy resistance training on body composition, muscle performance, and serum and muscle creatine levels. J Int Soc Sports Nutr. 2009 Feb 19;6:6.